The historic center of Alghero, Sardegna is chock full of eateries serving everything from tourist drek like crepes and waffels to exquisite Sardinian fare. Guess where we ate? Yup – if it was Algherese style food – or any Sardegnian traditional yummy – you would find us there. Jack and I are incredibly fortunate because our pal, Nicola Schroeder – one of the administators of ace language school Centro Mediterraneo Pintadera – has lived in Alghero for over 20 years, knows we are foodies and has never given us a bad recommendation. Pintadera is not just a school it is a bastian of information on all things tasty in Alghero. 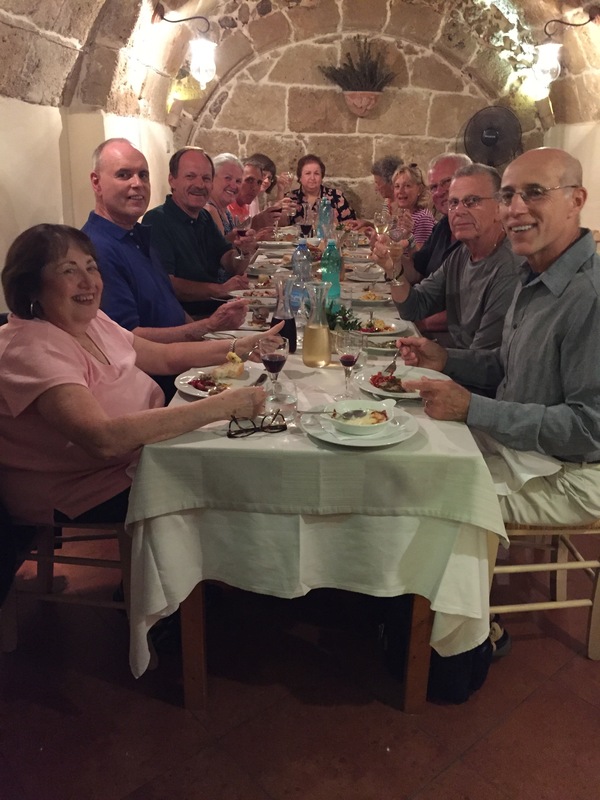 As part of our two week language immersian course, Nicola oranized a welcoming dinner at Tratoria Lo Romani, Via Principe Umberto 29. The menu was a wonderful introduction to artigianal Sardegnian fare. Owner, Gigi treated us like family. We started with antipasti della casa (selezione dei migliori salumi e formaggio sardi) – think platters of antipasti including melted cheese, fried red peppers, roast pork with carrote e zucchine, sardinian prosciutto two kinds of hard sheep’s milk cheeses, roasted vegetables and cubes of vegetable frittata. We groaned and kept on eating. Next ravioli with cheese, potatoes and mint. Gulp, I asked is there more? Of course. Mallereddus alla campidanse – Sardegnian mini gnocchi followed. Carafes of local red and white wine were constatnly filled. Burp. What? Now he is plying us with Sardegnian digestivi – two types of Mirto and limoncino. To see if if our love for Lo Romani was true love or just starving tastebuds kicking in, we went back on our own. Gigi recomended Granchione with linguine. Granchione? Hmm – in my best Italian I said “non capisco”. Gigi replied – linquine is spaghetti. 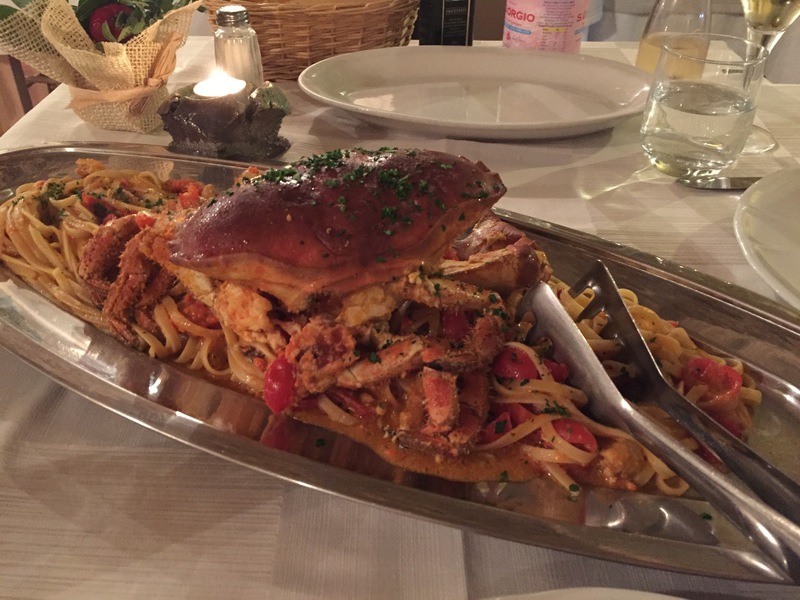 How about Granchione – big crab. Crab is my favorite food in the world and the thought of big crab had me salivating. This dish was so perfectly prepared that I danced out the door and have told everyone I’ve bumped into to head over to Trattoria Lo Romani at Via Príncipe Umberto, 29. Yup, true love! Oops, it is 4 o’clock here in Alghero. You know what that means! It is cocktail hour! I better write about my third favorite restaurant and head on over to the bar for an apertivo. One morning in Italian class my nose started twitching. The incredible smell of garlic being tossed in olive oil was wafting up from the restaurant below through the open windows of Pintadera. Who could think about Italian grammar. All I could think about for the next two hours was ho fame!! Our Italian classes get out at 1 PM. Jack and I raced down the steps and slid in an outdoor booth at Al Refettorio. The restaurant is located on Vicolo Adami,47. I had an insalatina di polpi – octopus – that was so fresh I thought I was swimming with it. Next I had a creamy baccala montecato. I had discovered this awesome dish on Murano and eat it whenever I see it. Jack loves tuna and had both carpaccio di tonno and grilled tuna. He raved about both. What? You think all we do is go out to eat? Nah. We love our Italian classes and don’t cut them for a nosh. Besides if we didn’t go to class I couldn’t ask Nicola for restaurant recommendations. I am truly entering old age in a good way – my daughter is having a baby (girl) in early January!!!! Annette, Auguri !! We will connect his winter. I look forward to pre-nonna stories. Sounds like you are increasing your restaurant Italian in the best possible way. I envy you the fresh octopus. We have a greek restaurant in Long Branch that does a pretty good grilled one but yours definitely sounds fresher. I agree with Annette. I’m so jealous. So do you and Jack have to START a place like this of your own in order to get food like that when you go back to The States?